American roots rock band Nathaniel Rateliff & The Night Sweats have just announced plans to release their highly anticipated new album Tearing at the Seams on the 9th March this year. The album is the follow up to Nathaniel Rateliff & The Night Sweats’ highly successful self-titled debut. “For the first record, I demo’ed everything up and created most of the parts,” said Rateliff. “This time, I felt like we’ve all spent so much time on the road that we should all go off somewhere together. We should all have that experience together. The third artist announcement from Bluesfest dropped today, headed up by a trio of powerful women – Kesha, Sheryl Crow and Melissa Ethridge. Joining them this time around are a host of artists that will no doubt get Timber and Steel readers excited including Afro Celt Sound System (above), William Crighton, Elephant Sessions, Newton Faulkner, Harry Manx, Juanes, Seu Jorge, Ziggy Alberts, Ásgeir, Harts and Holy Holy. The latest single from roots singer-songwriter Nahko’s debut solo album My Name Is Bear is “Be Here Now”. The track shows off Nahko’s eclectic styles and comes complete with a goofy lyric video. The next wave of artists have been added to the Bluesfest lineup this morning and as expected there’s a bunch to get excited about. This round of artists includes the likes of Michael Franti & Spearhead, Jackson Browne, Jason Isbell and the 400 Unit, Benjamin Booker, Hurray for the Riff Raff and The Teskey Brothers plus Youssou N’Dour, Seal, Gomez, Rag ‘n’ Bone Man, The Original Blues Brothers Band, Jimmy Cliff, The Wailers, Canned Heat, Walter Trout and André Cymone. We’re well and truly into festival announcement season with the first huge reveal for Bluesfest 2018. Heading up next years lineup is the one-two punch of musical legends Lionel Richie and Robert Plant & The Sensational Space Shifters. That’s definitely going to make a lot of people excited. Joining them in this lineup are a bunch of Bluesfest regulars plus some first timers including John Butler Trio, Tash Sultana, The New Power Generation, CHIC featuring Nile Rodgers, José González, First Aid Kit, Morcheeba, Gov’t Mule, Lukas Nelson & Promise of the Real, The California Honeydrops, Eric Gales, Bobby Rush, Dumpstaphunk, Joe Louis Walker, Rick Estrin & The Nightcats and many more to be announced. If previous years are anything to go by then this is just going to be the tip of the iceberg so get excited! If you read our review of this year’s Bluesfest you’ll know that Lloyd Spiegel was one our favourite artists of festival. So we’re super excited to hear that Spiegel has just announced a new album and an east coast tour. The album is titled This Time Tomorrow and is due for release on the 3rd July. Lloyd Spiegel wrote the album while travelling through Europe, Central and North America, all of which had a influence on his blues and roots sound. It may only be August but that doesn’t mean it isn’t time to start thinking about the 2017 festival season. This morning Bluesfest launched their first round of artists for next years festival and it’s huge. This morning’s announcement includes Zac Brown Band, Patti Smith, The Lumineers (above), Buddy Guy, Bonnie Raitt, Mavis Staples, Billy Bragg, Jethro Tull, Trombone Shorty, Gregory Porter, Snarky Puppy, St. Paul and The Broken Bones, Beth Hart, Laura Mvula, Roy Ayers, Booker T Jones Presents The Stax Records Revue, Andrew Bird, Rickie Lee Jones, Joan Osborne, Turin Brakes, The Strumbellas, Jake Shimabukuro, Dumpstaphunk, Nikki Hill and Irish Mythen with more to be announced. Bluesfest takes place over the Easter long weekend for the 13th to 17th April. For more information including how to get your hands on tickets check out the official site here. Feature Artists: Courtney Barnett, Little May, The Button Collective, Gary Clark Jr. The line up was a great collection of many talented musicians from a vast array of genres. In terms of Timber and Steel acts, there were four main highlight acts to catch at Falls. 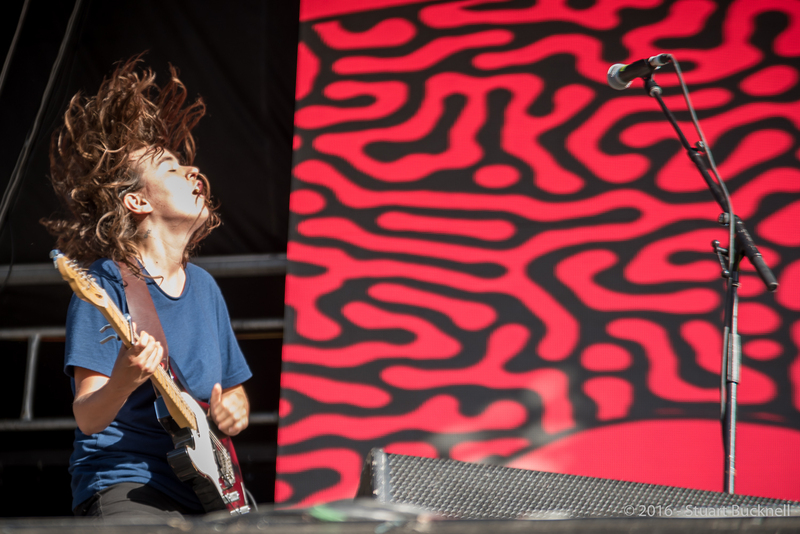 It’s been a big year for Courtney Barnett, 2015 has seen her juggernaut debut grow in to dominance of the charts and the hearts of Australians of almost all musical persuasions. Clad in desert boots, jeans and a hat that only lasted a song and a half, Barnett didn’t hesitate to launch with full energy in to her huge set on the Valley Stage for the first day of the new year. The audience sprawled across the lawns, from the raptured fans at the front, to the chilled punters on the grassy slopes at the back, all completely fixated on the multi award winning yet demure figure. Highlights from her set include that rare quiet moment as the entire Valley hushed for the opening notes of Depreston only to then have every voice heard singing along in unison, and her huge hit Pedestrian at best close her set in full rock-goddess energy while the crowd reached the peak of their high spirited, dancing frenzy. Little May is an act I’ve seen popping up time and time again on my social media feeds and have been keen to catch. The trio took to the Forest Stage on the last day of the festival, with their backing band at the ready and strong audience numbers eagerly anticipating their set. And the ladies did not disappoint. 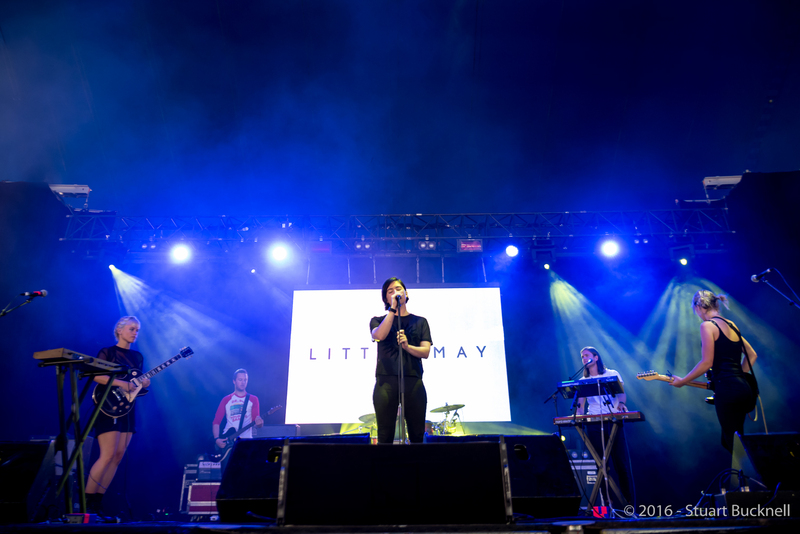 With honey golden vocals trickling through the all encompassing tones of the full band’s live act festival sound, Little May treated the crowd to a full course of sweet temptations. With highlights including a beautiful rendition of the ballad, Seven Hours, to the new track Cease, the trio gave a consistent, high quality musical spectrum for the crowd to relax too, from the folk tinged to the indie pop and alternative sounds. Their repertoire allowed them range from their silky, harmonised ballads to bold, anthemic tones of Dust, through the tale telling of Hide and finishing off the performance with a stellar performance of their Great Southern Land Like a Version cover. I can only hope that Paul Kelly himself caught even a glimpse of this up tempo take on his classic track with their clever use of vocal layering as it’s the last time they will be playing it for a while. Over in Lola’s Bar, on New Years Eve, we stumbled upon a likely scene of rag-tag musicians and a tent full of eager punters. It was 2pm but the Button Collective soon had the dance floor packed with joyful revelry. Appearing as a 6-piece line up each day of the Byron stint, the sheer energy and cheer emanating from the stage was infectious. With everything from the traditional folk, to country-tinged tracks that invoke foot stomping, the Collective had a winning combination on their set list. With Barn-dance like hoedowns springing up on the dance floor, and multiple Irish tunes mashed-up to treat the crowd, Lola’s Bar was the scene of frivolity for their entire set. The Button Collective brought sea shanties, bluegrass, folk and an array of short, punchy, fast paced tracks and still bowed to the whim of the crowd, playing more dance tracks whenever the crowd demanded. So spirited was the audience, that a conga-line formed and snaked its way around the dance floor until every punter was a part of the line, and then spontaneously erupted in to a mass hoedown. To say The Button Collective put on a good show would be an understatement… I’m sure the word ‘rollicking’ should be used. Finally, on the last night of the festival, I had the pleasure of witnessing the sheer ‘cool’ of Gary Clark Jr. His live sound reminds me of Ash Grunwald sans distortion, they both clearly dig a similar edgy blues style. Clark Jr. weaves effortlessly between styles, from a Lenny Kravitz swagger, to an occasional Hendrix vibe and all while navigating through blues soaked solos. The crowd grew steadily as his wavering wails swept the Valley. Dipping now and then in to old school rock, and then rolling through the blues to keep the audience on edge, it was like watching a master at work. Clark Jr. saturated the audience with electric riffs and transcended into another world onstage, so steeped in the moment and the music. He seamlessly melds his music on stage, from cool blues to upbeat jump around funk blues. 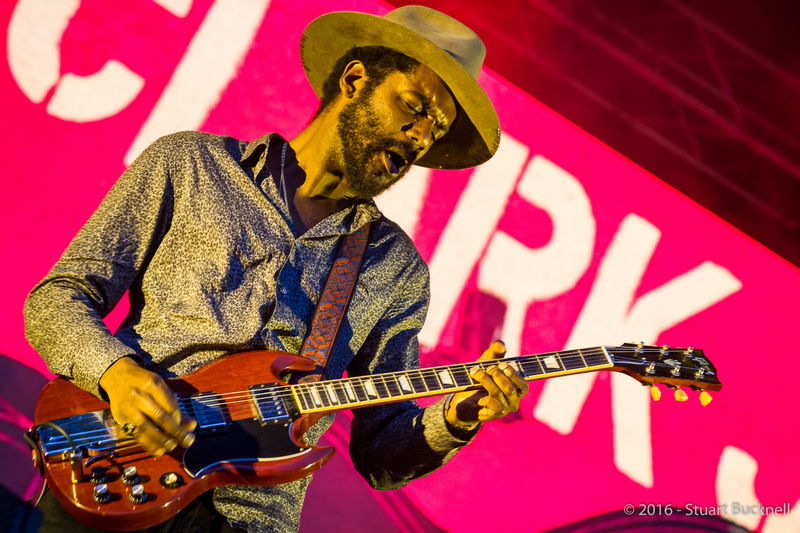 Gary Clark Jr. is worth every moment you can fit on your festival planner. While these four were some of the main focuses of us Timber and Steelers, there was a wealth of talent throughout the Falls line up to whet the appetite. 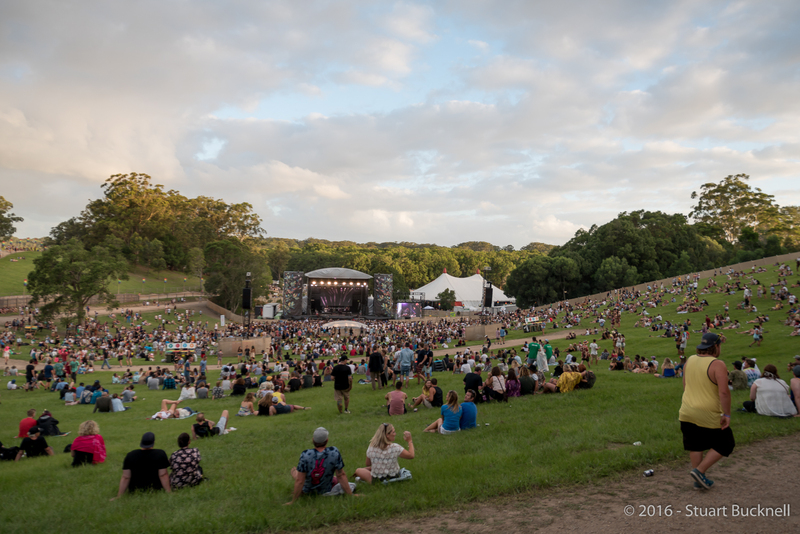 Read our Overview of the entire Falls Festival Byron Bay event.